It’s hard to believe how these tiny grains of chia seeds once consumed by Aztecs warriors could pack such a boosting power until I personally tried it. After getting rid of depression and anxiety a few years ago, my diets have changed and I am particularly mindful of what I have for each meal. I was browsing for nutritional supplements in a local pharmacy when I came across a pack of organic chia seeds. I remembered it being a brain superfood, and its energy boosting attributes that used to power up the Aztec Warriors. With a long list of health benefits attributed to chia seeds, I bought a pack and gave it a try. But before I share my own experience with taking Chia seeds, let’s take a look at a few facts on this ancient grain. The usage of chia seeds can be traced back to as far as 3500BC amongst the ancient Aztec tribe. The word “Chia” means strength in the Mayan language. This is reflected in how chia seeds being consumed by the Aztec warriors who are famed for their strength and stamina. This is a popular hype about chia seeds. With 11g of fiber for every ounce of chia seeds, it’s known to be a high fiber grain. Diets with high fiber are often linked to weight loss. That’s because fiber is not digested and it takes longer for you to feel hungry. However, be prepared to be disappointed as a study published in Journal Of Obesity proved little connections between taking chia seeds and reducing your waist line. This doesn’t mean you should disregard chia seeds completely, as the benefits in another aspect of your health outweigh its ineffectiveness in promoting weight loss. Chia seeds contain Omega 3 acids, protein, and fiber; which is believed to be effective in promoting a healthy heart and reduce cardiovascular disease. However, it is too early to draw a conclusion if chia seeds are of any benefits to your heart. 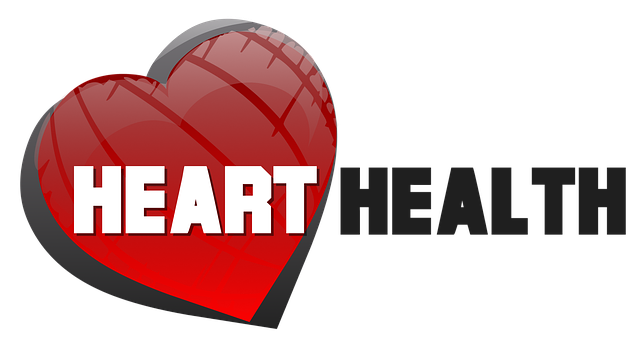 Clinical studies on humans that involve consuming a beverage of chia seeds, soy protein, oats and nopal show a lower level of triglycerides, a fat in the blood that is linked to heart disease. However, limited studies that take into the consideration of lifestyles of the subjects made it too premature to conclude chia seeds as beneficial to heart health. Will two teaspoons of chia seeds really keep those wrinkles away? Chia seeds abundance in Omega 3 oil may function as a supplement that protects the top layer of our skins, and promote wound healing. Numerous experts have claimed that its antioxidant property could help in reducing skin aging. Chia seeds could help in reducing anxiety and depression, but not with the Omega-3 fatty acid it contains. Chia seeds Omega- fatty acid comes in the form of ALA or Alpha Linolenic Acid, where the human brains benefit from DHA. Instead, chia seeds are rich in magnesium, with 95 mg in 1 ounce of chia seeds, another critical brain boosting nutrient that is often associated with reducing anxiety or depression. Chia seed is loaded with protein and fiber, delivering the much-needed power fuel to last the day. It is the equivalent of taking energy drinks without the high sugar content. A study that compares a group of athletes consuming a can of Gatorade and another group replacing half of the energy drinks with chia seeds reported equal performance with the second group consuming much less sugar. Yes. There are side effects to consider before you start taking chia seeds as part of your diet. Chia seeds itself function as a blood thinner. If you are having problems with low blood pressure, you should stay away from chia seeds. Or if you are already on blood thinner medication, do consult your doctors before taking chia seeds. Less severe side effects like bloating, gas and cramping from the slow movement of chia seeds. Chia seeds could absorb water up to 28 times its own weight. There is one documented case of a man who swallowed a tablespoon of chia seeds and drinking a cup of esophagus only to have a blockage in his esophagus hours later. Apparently, this man has a higher risk for suffering dysphagia(difficulty swallowing) due to his history of asthma and allergies. 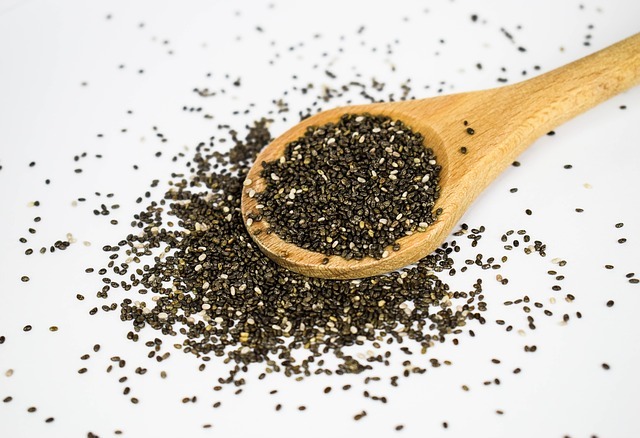 While the effects of chia seeds on pregnant women are not fully studied, doctors have advised pregnant women and breast feeding moms to stay away from chia seeds. At the time of writing, I’ve been taking half teaspoon of chia seeds raw daily for two weeks. To be frank, I wasn’t expecting much from these tiny black grains in such short period of time. But here’s what happened. True to its name as a runner food for Aztec warriors, I did not get exhausted easily, physically and mentally after taking chia seeds. It was like me getting back that kind of stamina that during my 20s. As a single father, coping with financial duties, house chores and taking care of my son, I usually get pretty low energy towards the end of the day. But these chia seeds do give that extra boost of much-needed energy. Another aspect worth mentioning is my eczema that’s getting worse recently. 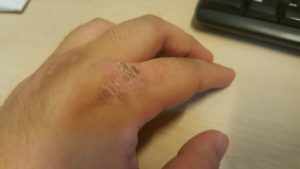 I had a history of eczema, where the skin on my knuckles could turn dry and dark to the extent of causing pain. It has been dormant for years but the symptom returned a few weeks ago. I tried moisturizer and Betamethasone Valerate cream but to no effect. While I couldn’t say for sure taking chia seeds made my eczema better, the skin on my knuckles definitely showed signs of healing right now. Should You Take Chia Seeds? I think this is a decision best made for yourself, taking into account the benefits and side effects involved in taking chia seeds. If you’re convinced that chia seeds could be a great part of your diet, I believe you can easily get a pack from organic stores, pharmacies or online. Check out the best organic chia seeds brand here. Have you taken chia seeds? Do you feel the energy-boosting effects that it claimed? Share your experience in the comment below. Fidget Spinner For Anxiety: Marketing Hype Or Genuine Stress Buster?